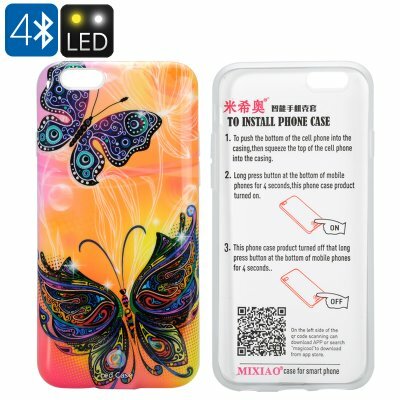 Successfully Added LED iPhone 6/6s Case - Butterfly Design, 5 LED Lights, Free APP, Call Notification, 300mAh Battery, 10 Hours Usage Time to your Shopping Cart. The colorful LED lights in this case provide more than just protection for your cell phone. Pair the case to your phone via Bluetooth and use the free Magicool app to control the lights as you see fit. You can have the case respond to music your playing and light up to the tunes, set the light to match your mood from the wide array of hues on the color wheel or have the case notify you of incoming calls. For nature lovers and spiritually guided individuals this iphone case is sure to lighten up your day and lift your mood.